Sometimes, the morning routine must be faster than you'd like, leaving you wondering what to eat. Not to worry. Quick breakfasts can still be healthy. Organic Granola is Healthy and Fast! 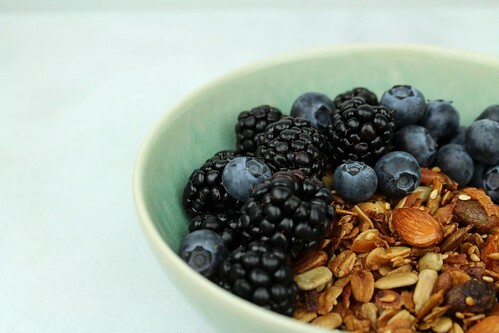 You probably already know that organic granola is healthier among breakfast foods. But do you know why? It can lower cholesterol, is said to increase energy, may aid in weight loss, is heart-healthy, can regulate digestion, may prevent anemia, can increase cognitive abilities, may help manage diabetes, can improve skin health, can stimulate new hormonal and tissue growth, can build stronger bones, and may even prevent cancer. When you're in a rush, you need breakfast foods you can just grab and eat. Cereal bars can be great for that. Just be sure to choose the right ones. All of them aren't all they're cracked up to be. But many of the organic ones are very healthy. Look for ingredients like pumpkin seeds, flax seeds, whole rolled oats, bananas, and other fruits or whole grains. Try to avoid things like high fructose corn syrup. Toast is quick and easy to take out the door for breakfast. Peanut butter itself is healthy, when you choose a good organic blend with only simple ingredients. But choosing the right bread is also key. Organic darker whole grain breads, such as whole rye, pumpernickel, and flaxseed are often healthier.